What’s the rationale for comparing roots to business? So making sure a balance is struck between the business foliage (growth and projects) and the below surface stability (admin and systems). How do you stop being unbalanced and wobbly in the wind ? How do you ensure your roots keep you grounded? Roots, the bane of a woman’s life, and for some men, who are we to judge. But in some form or other we all have them, lost them, put down new ones, need and crave them. They are an anchor or a beginning. In the Brain Garden they are the portals through which nourishment can be sought and transported. Left though to their own devices, they can become invasive, finding their way into parts of the garden where they are much less welcome. Indeed, frankly draining. They can encroach into other gardens (businesses) making you a tad unpopular. But let’s be positive. 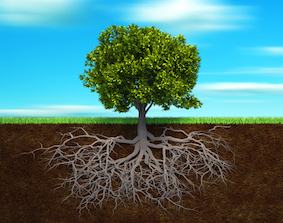 Firm roots can provide a secure foundation for your Brain Garden, business needs. Frequently when preparing your vision/design, the sub terrain can be overlooked once the soil is established and all appears to thrive. Of course, there are exceptions to the rule. Weeds, mostly. But for healthy productive plants sound roots and good soil are key. Once established, whilst anchoring, roots allow the growing ‘visual ‘ plant, (business face), to safely move with shifting winds. To quote Dolly Parton, “storms make trees take deeper roots”. And we would be naive to think that storms will not occur from time to time. If though you are a little top heavy, this could leave you with a bit of damage. Prune. Be rigorous. You cannot, in business or Brain Garden work around the plant, (staff or company) that by stint of always being there, you avoid taking the secateurs to. It is not easy and needs careful and delicate assessment. Perhaps employing some of the permaculture ethos or relocation. With support and advice, new skills, growth may occur, reinvigorating the whole Garden. It is a question of balance (Dolly and Tess). If balance is not achieved, the plant, (staff member, area of business), may have to go. This is especially difficult if this was a main attraction in your Garden. Your go to Plant that was a focus for your design. But remember, it was and is your design and you can alter it. Wherever possible get to know as much about the plants you want before investing. Can you forecast their overall growth potential, root map, (self development). Dig a little deeper. Where do you see yourself in five years time? – taking over this Garden/business… oooops. Full circle we go and arrive back at balance. The Dolly Principle. Balance between roots and surface structure. (Dolly always wears heels). Refer back to your basic garden vision. Some things are best to be clear on. But we are only human and Gardens are Gardens. Roots being roots may find a way of maintaining the plant they are supporting. It all comes down to the balance. Try to embrace the seasonal ebb and flow, whilst not just assuming everything is performing as expected. A knowledgeable gardener expects that his peonies and dahlias will require extra support when in full bloom to avoid drooping (business breakdown). Wisely he nurtures and tends to his best plants to ensure propagation (succession planning). Gardening is one of life’s greatest pleasures and challenges, never perfect, always changing, so it is imperative that we take a step back from time to time and give ourselves a well earned break. It is a trend nowadays, a good trend, that businesses are caring more about the environment by either selling environmental friendly products or using environment friendly products as well as CSR initiatives that are pro environment. I have spent some time looking round your new website….What can one say? It is beyond brilliant. I just love the `Blog’ – and the gardening system `works’ – Establish good roots – know what you are grounded in, where your values are and you are in a much better position to grow a balanced nutritional diet Brilliant! Every encouragement.